South­ern Cal­i­for­nia Region­al Occu­pa­tion­al Cen­ter (SoCal ROC), Com­mu­ni­ties in Motion, and the Chy­na Nicole Foun­da­tion have launched a part­ner­ship to sup­port Tran­si­tion­al Age Youth (TAY) between the ages of 16–24. 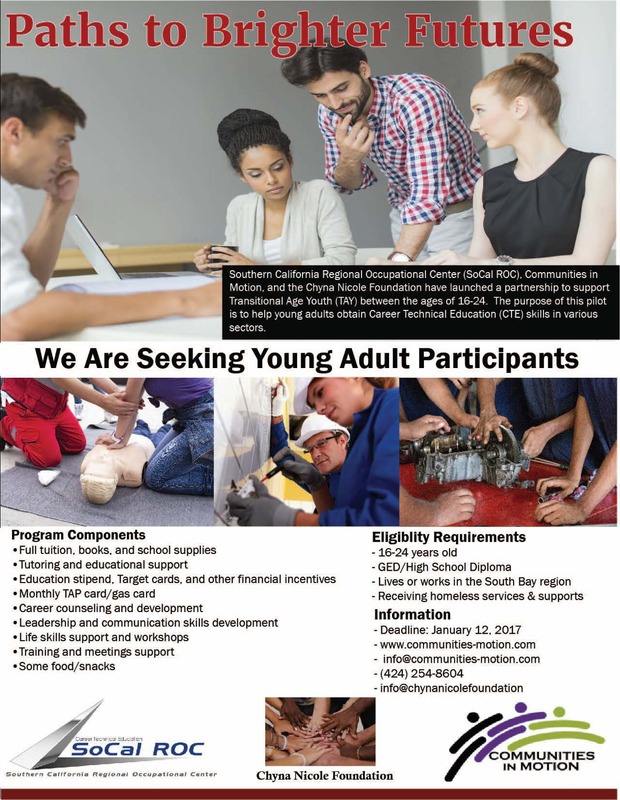 The pur­pose of this pilot is to help young adults obtain Career Tech­ni­cal Edu­ca­tion (CTE) skills in var­i­ous sec­tors. Apply online on the Com­mu­ni­ties in Motion web­site by Jan­u­ary 12, 2018. Pro­gram is free tor young adults who meet eli­gi­bil­i­ty and are accept­ed into the pro­gram.